Take this private walking tour through New York's historic Downtown and learn about some of the most famous places, people and events in city history. Sights and topics will include the Statue of Liberty and Ellis Island (from Battery Park), the evolution of Wall Street, the 9/11 Memorial, the Charging Bull, Trinity Church, St. Paul's Chapel, Federal Hall, and much more. Your private walking tour begins next to New York's oldest park, Bowling Green, where your guide will discuss its connection the Revolutionary War. You will also learn about the famous Charging Bull sculpture and find out why it's not actually on Wall Street. You will also see the Custom House, considered one of the most beautiful classical buildings in the city. The tour continues from here to the edge of Manhattan to see and learn about the Statue of Liberty and Ellis Island with views from Battery Park. You'll enjoy spectacular harbor views while learning about these two famous landmarks. After this Battery Park detour, you'll resume exploration of Downtown Manhattan by diving deeper into the heart of the Financial District. 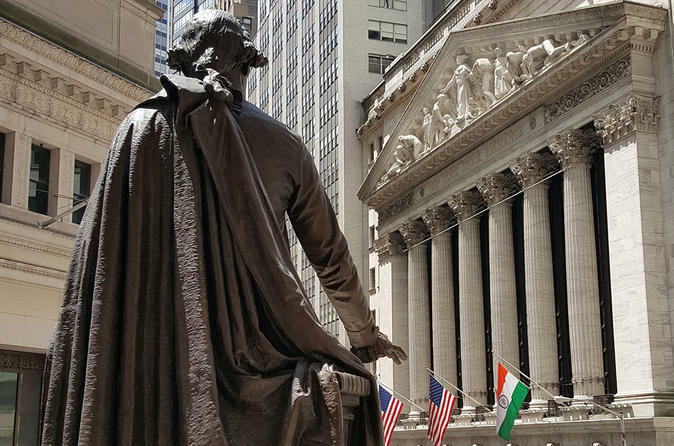 This will include a walk on Wall Street, where you will see and learn about the New York Stock Exchange, the former JP Morgan Headquarters, and the place where George Washington became our first President. Then head to Trinity Church and see the burial site of one of Alexander Hamilton, one of America's Founding Fathers who happens to grace the ten-dollar bill, where you will learn about this man's life and untimely death. Choose from a 3-or-4-hour option with just you and your party. The tour will end with a visit to the 9/11 Memorial where you will learn about the redevelopment of the World Trade Center. Note: 9/11 Museum visit not included, but can be done independently after the tour.